The contrast and the drama of a Kimberley cruise (on board True North). Here it is: the greatest holiday of them all. And for all the other amazing experiences on offer, we can’t say we’re surprised to see this come out on top. The Kimberley – bigger than the state of Victoria, among the oldest landscapes on Earth – is particularly talented at claiming the biggest of all superlatives, but there’s really nothing that can do justice to her outstanding array of waterholes, beaches, bushland and wildlife. What else could you want in a holiday destination, other than a way to get to it? Yes, she’s remote, but she’s definitely worth it. And there’s no better way to see theKimberley and her 2500-odd islands than by sailing ’round her edges in one of the world-class adventure cruise ships on offer. FIRST STEPS: There are several operators offering cruises around the Kimberley coastline, and really, it’s hard to go wrong with a cruise operator here, regardless of who you choose. Still, it isn’t a cheap holiday – the average per-night price is about $650 per person, not to mention the cost of flights to the region in the first place – and ship sizes vary greatly, from six-person boats to 100-person expedition ships. Some of our favourite operators are: North Star Cruises (True North), National Geographic Orion, Great Escape Charter Company, Kimberley Quest and Aurora Expeditions. Also check out the next edition of Australian Traveller – featuring a special of epic proportions on exploring the Kimberley by road, air and sea. I’ve looked at photos of these tours plenty of times; truly amazing. 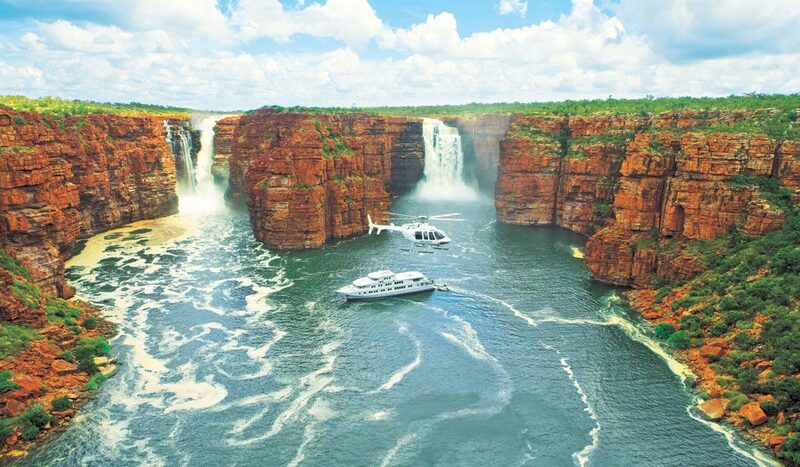 We hope to head to the Kimberley next year, but it won’t be via boat!